LiDAR stands for Light Detection and Ranging, which is a method of aerial survey through which the landscape can be examined in minute detail. A light aircraft equipped with a laser scanner flies over the survey area in swathes, taking millions of measurements to create an accurate 3D model of the ground surface. Vegetation can be filtered out so that the resulting imagery shows a true representation of the ground surface. This means that archaeological sites that might not be easily visible with the naked eye, such as those in wooded areas or under heather and bracken, for example, can be identified. Hundreds of new possible archaeological sites were identified during LiDAR survey undertaken in advance of the construction of Baillie Wind Farm. Download our guide to identifying LiDAR! The interpretation of aerial imagery has previously been considered a specialist skill and limited to areas where conditions are suitable for archaeology to be visible. 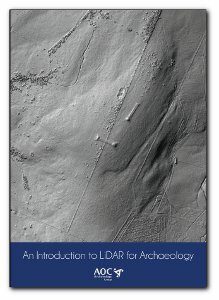 LiDAR, however, places the opportunity to investigate archaeological landscapes in the hands of participants in the project, providing an exciting opportunity for volunteers to be trained in the use of new, innovative and cutting-edge technology in one of the first such community projects of its kind in Scotland. Making use of the LiDAR data will allow us to target areas where traces of agriculture survive in association with visible structures, leading us to the most completely preserved areas of earlier prehistoric settlement. Field survey will provide the opportunity to verify the targets identified through detailed analysis of the LiDAR data, and where positive results are obtained, to map and record these remains accurately. Test pitting and soil analysis in those areas identified as high potential would reveal the extent and nature of earlier prehistoric settlement and its associated agricultural footprint. The results could radically change our perception of prehistoric settlement in Caithness, allowing a far more complete view of the settled landscape than has previously been possible. Detailed mapping and recording of these areas would not only provide a high-quality record of some of the best preserved areas in Caithness, but would also produce graphics and maps that could be used for interpretation, further research or in the creation of archaeological trails around those areas suitable for presentation to the public.